November ends today, and with it, NaGa DeMon. This year I did something a bit different, instead of trying to design a game from scratch like I did with Zombology in 2013 and Dragon Dance in 2014, I set myself the goal of making a print run of a game in a month instead. I set out hoping to make 20 copies of Zombology for the twenty people who immediately pre-ordered a copy of the short print run I announced back in May. After my promotion at work, I realised that on top of the job, the additional work-related travel, and the family, I would struggle to find the time to make 150 copies of a game, let alone do the marketing and convention visits required to sell them. But there were twenty people who had signed up for a copy at £9 plus shipping, so I would make those twenty copies in November for NaGa DeMon as a thank you to my pre-ordering chums. That was the plan. As with all plans, they didn't pan out. First my printer had got a new customer service rep, and her poor levels of customer service meant I needed to find a new printer, and test them. Thankfully, I found Bang On Print just round the corner from work. Because they were an unknown quantity (and I was trying something new with the box labels), I wanted to make a test copy first to check everything worked OK. So I had to give them the art and £50 and then wait a few days for the first copy. Once I'd got that back and assembled it, I had to go back and give them another £205 for the remaining 29 copies. The astute among you will notice that 1 + 29 != 20. I had to increase the size of the print run to thirty to avoid losing a chunk of money on the printing. Fortunately I have 25 friends and family and another six of them stepped up, so now all but four of the print run are spoken for. Fortunately, with some babysitting and a couple of mornings in work-related hotels I've managed to do most of the graphic design changes for a Print of Demand version, my self-imposed stretch goal - I'll be making this available after I've finished and shipped the hand-made ones. It was a very different NaGa DeMon experience, but it reminded me just how much I enjoyed hand-crafting games back in the day - I find it a very relaxing way to spend an evening (or ten!). But in a good way! This morning I'm in a hotel in Manchester, waiting for my colleagues to wake up so we can go for breakfast. Seeing as I expected to wake up early, I took my laptop with me so I could work on the graphic design for the Print on Demand version of Zombology (a NaGa DeMon stretch goal). Last week while babysitting I resized all the cards (which was a surprising amount of effort), this morning I've laid all the cards out in the order that the POD supplier wants them in. The POD version is still not quite finished, seeing as the game will come in a clear plastic deckbox, they recommend adding a couple of extra cards, one at the front and one at the back to act as front and back box labels. I've not done those yet, but I don't envisage them taking a particularly long time, so nearly there. Monday night I made another copy of the real game. Unfortunately, only one. By the time I'd put The Daughter to bed, packed for my trip to Manchester, ironed a shirt and had some tea it was nearly nine and I had to be up at five the next morning. So my best guess is now 14 finished copies by the end of the month, which I hasten to add is not 20. It's a shame that I'll not be able to complete the full twenty copies by the end of the month, but real life is more important! It's been a week of two halves. To begin with, I spent the first half of the week just cooling my heels waiting for the artwork to arrive back from the printers. I paid for the rest of the print run on Monday and was warned that I wouldn't get anything back until this week probably as they were very busy, so I was just sat there thinking that that had screwed my attempt to get the print run made in November as part of NaGa DeMon. Come Thursday I was itching to get started on something, so during my evening babysitting for some friends' kids I started working on the graphic design for the Print on Demand version. It involves resizing the cards from the 55 x 80 mm that fit nicely onto a sheet of A3 card to 2.5 x 3.5 inches (which is apparently US Poker size). Then, once that is done I've got to create a new file that lays all the cards and their backs out in a new order. It's a bunch of work. Fortunately, I got loads done on Thursday evening, all the cards were resized and I got halfway through the new card ordering too! Then Friday the art arrived earlier that I was expecting - awesome! I've spent the weekend evenings rattling through. Friday I cut out 21 box labels (I meant to do 19, enough to make the twenty original copies including the prototype that I did last week, but it turns out counting to 19 is not my strong suit). Saturday I stuck all the box labels on, finishing all those boxes. Sunday I started making the games proper. My thinking was that i would get pretty close to finishing the print run - I've only four evenings to make the games proper: yesterday, tonight, Thursday and Friday as I'm away on Tuesday and back late Wednesday, then my parents arrive on Saturday. My guess (based on making earlier prototypes) was about 35-40 mins per copy, so about 13 hours, I get two or at most three hours an evening, so I might get pretty close. Last night I spent 3:15 on it and made four games. Fifty minutes each. The slippery laminate and the un-trimmed sheets slowed me down a chunk as I had to take more care to avoid mistakes. So, again, it's looking impossible, hopefully I can get maybe 15/20 finished before mum and dad arrive. I will however take my laptop to Manchester with me, and spend an hour or so on Wednesday morning working on the Print on Demand version. NaGa DeMon 6: Let's Go! I got a phone call from the printers on Friday afternoon to let me know the art for Zombology would be ready that evening at 5:15 (just after they officially shut!). So I left work and trooped across town to collect it all. This is awesome, they were originally saying it would be ready next week, but next week I've only got three free evenings and then next weekend my parents arrive for a week long visit, so that would mean I only had three evenings in total to cut out the box labels, stick them on, cut out the cards and fold the rules for the 19 copies remaining of the 20 I'm aiming to complete by the end of the month. The boxes are all made (all 30 of the print run), but labelling them and doing the cards I reckon will take about 45 minutes per game or just over fourteen hours in total. Getting the artwork on Friday evening doubles the amount of time I have available for construction - I've now got last night, tonight and Sunday night as well. Fourteen hours between six evenings is a far more achievable two and a half hours a night rather than five. Last night I cut out all eighteen box labels (there's two per sheet so I had two already from the prototype test run), and finished a second box. Tonight I hope to finish the remaining eighteen boxes and possibly even start on the cards for the second game. As promised on Monday I went back to the printers to pay for the remaining 29 copies of the print run after the success of the first copy. The good news is that payment was made and that I'm just awaiting delivery of the finished printing. The bad news is the timing. This week I'm moderately busy, it's Games Night tonight and I'm babysitting for a friend tomorrow, but other than that I'm free, including this weekend. 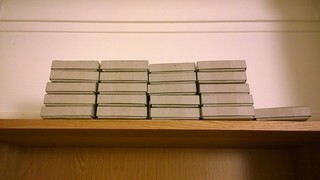 So I've quite a lot of time to do the construction of the remaining 19 copies. The artwork won't come back from the printers until next week though - they're very busy this week. This week I'm just cooling my heels. That's pretty much knackered any hope of getting it done by the end of the month as I'm away for two nights next week and then my parents arrive next weekend for a week long visit. So if I don't get the art until next Monday I have only three nights to finish it off. I estimate there's 40 minutes work per copy left, so 40 x 19 = about 13 hours left. Considering I don't get to start until 8ish and I go to bed pretty early, that's going to be a struggle on three work nights. On the plus side, I'll take my laptop with me when I go babysitting on Thursday and away for work next week, so I should be able to make some progress on the stretch goal of getting the artwork ready for the print on demand version. This week has been a rollercoaster. It started on a high as I finished the boxes off and sent the art to the printers on Monday. Then there was the wait. Endless waiting... years passed. Finally on Wednesday the printers emailed me to tell me the art was ready to collect, so I left work early and headed over there on the way to collect The Daughter from nursery. The printing looked good, but Oh no! The laminate! On the untrimmed sheets it looked really messy and I was worried that it hadn't bonded as well to the paper as I remember it working for Border Reivers. This lunchtime I'm heading off to the printers to pay for the rest of the copies and then I've got a few more days of rest before the epic finale of trying to make the remaining copies by the end of the month begins. I should sleep while I still can! In other news, on Saturday night I made it to Newcastle Gamers after finishing the prototype. We played Macao and Homesteaders - knocking two plays off my ten plays goal and removing Macao from the list. On Tuesday morning I finally finished all thirty game boxes, then it was just a case of waiting for the proof of principle artwork to arrive back from the printers. The proof of principle copy is a single copy printed using the same printing and finishing as the final copies, so that I can check everything works OK before splashing out on the full print run. The proof of principle is costing me £50, but the remaining 29 copies in the thirty copy run cost £205, so the total cost is £255, just under £9 each. Once you discount the copy I'm going to keep for myself and the copy I'm giving to the font creator, I'm only losing £3, which is entirely acceptable. I've not used these printers before, so I wanted to check out the quality before committing £250 to the cause especially as there's also something I'm doing for the first time: printing the box wrappers onto self-adhesive labels - I need to check that this works ok. For Border Reivers and It's Alive! what I did instead was to print onto laminated paper and then paint the other side of the paper with watered down PVA glue which I then stuck onto the naked boxes. I collected the proof of principle from the printers last night and have already folded the rule sheet and checked that works OK. 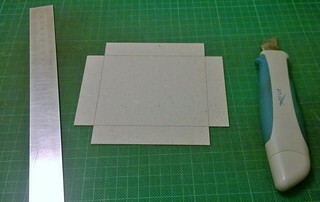 The next step is cut out the cards and the box wrappers and stick the wrappers on to see how that works. Both the box labels and the cards have been laminated - not in the horrible thick plastic pockets that you can do at home or in the office, but professionally. Professional lamination applies a very thin coat of plastic to the paper which gives it a nice smooth feel and also protects the ink from handling and wear and tear - very important for a card game! I'm moderately concerned that the lamination isn't as good as the stuff used on Border Reivers. My copy of Border Reivers was printed in July 2006 (nine and a half years ago!) and has been played at least a hundred times - it was the official demo copy during the year I was trying to sell out of Border Reivers and recently we've been playing it again at Newcastle Playtest while I work on a second edition. The Border Reivers cards arrived as two sheets of A3 card that I cut the fifty cards out of using a steel ruler and a craft knife and all these years later they still look perfect - there's no sign whatsoever of the laminate peeling round the edges or any bubbles where it has failed to ahdere properly. It's too soon to tell whether the new cards are as good, seeing as I've received unfinished sheets (SRA3) that haven't been trimmed so I'm seeing a different view to what I had of Border Reivers (plus my memory is terrible, so I can't really remember what the original sheets looked like for Border Reivers). What I need to do now is cut the cards and the box labels out tonight on my return from Manchester and see what the final thing looks like - if the laminate isn't good enough, I'll have to go back to the original printer, despite my recent poor customer service experience with them. Tonight all will be revealed! Historically, during NaGa DeMon my regular Monday morning blog posts were used to record the scores in the NaGa DeMon competitions I ran for people helping me design the game by providing feedback and playtesting the early cuts. Because I'm not designing a game this time there's no competition (known as The Game Within A Game or TGWAG for short) this year, since none of you have come to my house to help me construct the games. Thanks a bunch. So instead, I'm just going to do a quick recap on progress during the week. My best guess is that each copy is going to take 60-90 minutes to construct, so the twenty copies I committed to are about an hour a day on average, and the thirty copies I'm getting printed are an hour and a half a day worth of stretch goal. I'm doing this around a full time job, a family and a chunk of work-related travel, so that's going to be a challenge, but we'll see how I do. In the first week I've done almost seven hours construction, and in that time I've completed 24 boxes and all thirty inserts. The boxes are actually taking a bit less time than I was expecting, and the fact that the new printer can print onto labels means the box wrappers might be a lot quicker than I'd bargained for (sticking the wrappers on with watered down PVA glue was a bit of a faff for Border Reivers and It's Alive! ), saving yet more time. I'm almost at the point where I've done all I can until the artwork arrives, six more boxes and I'm cooling my heels. This week I've also got a trip to Manchester for work which will swallow up an evening and Games Night which swallows another. Next week I've got a night's babysitting for friends (I can't take all my construction stuff round theirs!) and the week after a two day trip to Manchester, so things are going to get tighter still. Must crack on while I can! NaGa DeMon 3: Insert Here! It was a good day yesterday, at lunchtime I'd been to the printers with the art on a pen drive and paid for the prototype. I'd got the guy at the printers to quickly check the art and it all looked OK, so fingers crossed that's a few days away now. I'm going to have to make thirty copies to avoid losing a bot load of cash on this, but I'm still setting myself a goal of getting the original twenty pre-orders done for NaGa DeMon, i.e. by the end of November. If I can get the other ten done, so much the better. My best guess is that the games will take about 1.5 hours per copy to cut out and construct. I've spent 5:45 so far, with twenty boxes made but no wrappers on them yet. 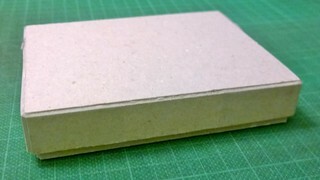 As I mentioned a couple of posts ago, the box tray is 117 x 91 x 20mm. 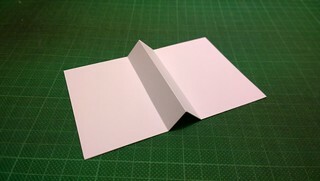 The insert has to fit in there, so it has to be less than 117 x 91mm in folded size. The cards are 55 x 80mm, so the two flat bits under the card need to be at least 55mm wide and I want it to almost fill the height of the tray (20mm) so there's little room at the top for cards to drift over. I've gone with two 55 x 89mm flat panels separated by a 19mm high peak. so the total width is 55 * 2 + 19 * 2 = 148mm and the height is 89mm. This is then scored three times - once on the front for the mountain fold and twice on the back for the valleys. Over the last few days I've been able to scrape together another couple of hours (now 4:15 in total!) 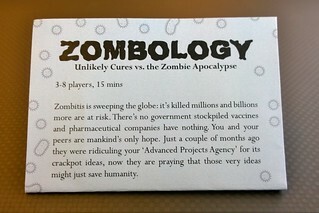 for making boxes for the Limited Edition run of Zombology. I've almost finished cutting out and scoring the 20 boxes for the print run, plus an extra one as a prototype dry run to test everything works OK before committing to the full 20 copy run. Once they are all cut out (I'm hoping to finish that tonight after writing and posting this blog post), the next step is to tape the boxes so that they actually form a box, rather than just two bent bits of greyboard. 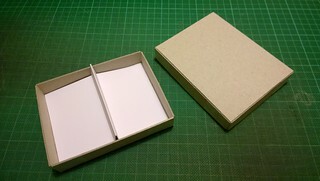 The next step from there is to make the box inserts: little bits of white card that will sit in the tray keeping the two piles of cards separate for easy setup. 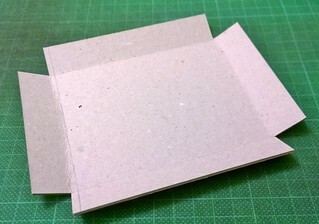 They're pretty easy to make - just a rectangle of 300gsm card with a mountain and two valley folds (which need scoring to fold neatly). In the meantime, I've been negotiating with a local printer for getting the print run printed out ready for cutting out and assembling. 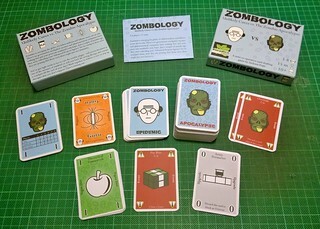 When I was thinking of getting back into games publishing as a business, I was going to do a print run of 150 copies of Zombology, and I'd priced that run up. I could get them done at a price that would allow me to sell them at £9 (a sensible retail price for such a game in the UK) while still making a decent profit that I would be able to re-invest in the next game I made. When my promotion at work and associated travel made that plan no longer achievable, I still wanted to do the short print run to thank the 20 people who had already pre-ordered a copy of Zombology, and I intended to do it for the same £9 per copy that I'd offered them initially. Now that I'm not intending to funnel the profits into a company, I'm happy to do it not making any money at all (even a slight loss is acceptable, seeing as I'm also intending to make it available print on demand in the US, which could be done for a very slight profit to eventually recoup the loss). The local printer (Bang On! Print and Design) has been very helpful and they're so close I can wander over there at lunchtime and have a chat with the staff. Unfortunately, the cost of such a short print run is too expensive for the £9 a copy I've been aiming for. However, they can do a 30 copy run for £9 a copy. Intriguing. A quick query on BGG has led to a few more takers, so tomorrow I'm taking the art over there at lunchtime to pay for a print a single prototype copy for testing their set-up. One of the advantages they have is they can print the box wrappers onto self-adhesive labels which, if it works, will be significantly less hassle than using watered down PVA glue like I did for It's Alive! and Border Reivers. I'm looking forward to trying them out! As I mentioned last week, for the last couple of years I've started designing a new game for NaGa DeMon, first Zombology and then Dragon Dance last year. Each year I've run a competition, complete with Pointless Internet Points (PIPs), achievement levels and prizes for the winners, to encourage people to help out by playtesting and providing feedback as I post multiple iterations of the rules. With Zombology, I spent another couple of years working on the game and I'm now ready to call it finished, so this year instead of designing a new game in November I'll be making a short hand-made run of one instead. So no competition I'm afraid this year, I can't think of a way you guys can help me make the games! I then bend up the side along the score line and tape the corners using Scotch magic tape (which has a matt finish which is better for the wrapper glue to adhere to). The large sheets of 2mm greyboard I've got are big enough for twelve rectangles, so I can do twelve games per two sheets - I needed four sheets for the twenty copy run and the prototype. Fortunately, I've got eight sheets at home already. Last night I cut out all the rectangles and scored folded all the trays. Time spent on the construction so far: 2 hours, 15 mins. In other news, I'm changing printers. I've used Stress Free Print in the past for Border Reivers and It's Alive! (back when they were called Asterisk Digital), but their new customer services rep has been particularly slow and unhelpful, so I'm going to try out a local company instead. I'm going to pop over at lunchtime today with a prototype and Border Reivers to discuss it and see what they can do.